Today we welcome guest blogger and FBA member John Dunn. John lives in Havana, Fl. The Jewel of Florida, 25 minutes north of Tallahassee’s I-10 exit to the capital, is the town of Havana. Havana has embraced cycling, it’s in the town’s master plan. A trail to Tallahassee is on its wish list. An opportunuty to experience Havana for yourself is coming soon. Havana Main Street sponsors the Havana Hills Ride February 24th, with 3,300 feet of elevation gain. That number is correct. There are two faces to Havana riding, the Hills and the Flats. The Hills are the watershed to Little River. They have always been the local’s training roads for Six Gap and Mount Mitchell. The Master’s National Championship was held there twice. The Hills were steep enough to make a selection, and long enough to make it stick. The Flats are moderate to easy rollers,. on lightly traveled roads. They connect Havana to the south Georgia towns of Calvary, Cairo, Whigham, Climax, Bainbridge, and Attapulgus. There is a convenience store every 20 miles. The Havana Springs Resort is 3.7 miles west of Havana, with a six-foot bike lane. Quincy is 12 miles from Havana on the same road. It has Bed and Breakfasts in the historic district. 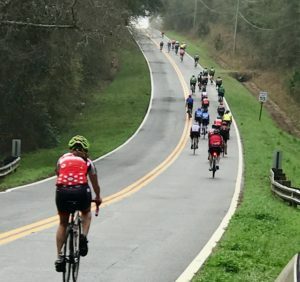 The best road riding east of the Mississippi River, during the winter, is this jewel of Florida cycling. It is a “Latitude with an Attitude”. Check the long range weather forecast. Make an executive decision to road trip with a friend. Fall and spring are beautiful. A cold winter day, with robin egg blue skies, is breath taking. Do you have a bicycle story to tell? Photos to share? Be our guest and be our next guest blogger! Send your story and photos to Becky@floridabicycle.org. Speaking of stories, our quarterly Messenger newsletter is available online for your internet reading pleasure. Visit the FBA website Home page or click here. Want a hard copy of our Messenger? Join Florida Bicycle Association or visit one of our bicycle shop members to pick up our FBA brochure.